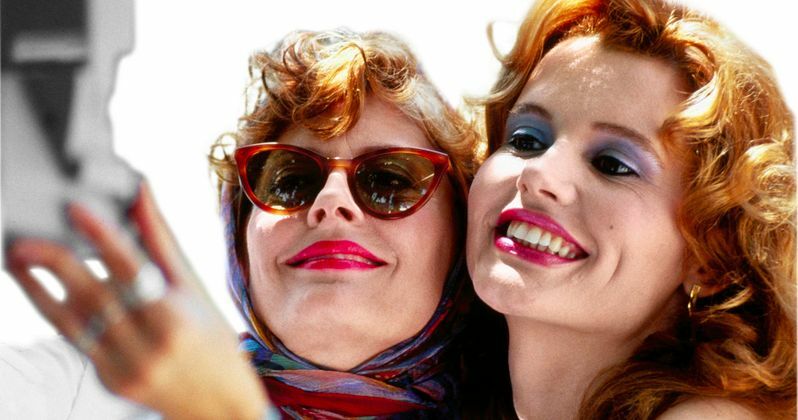 Did Thelma & Louise invent the Selfie? That's the bold claim Susan Sarandon is making today as she reunites with co-star Geena Davis to reenact one of the more iconic scenes from their classic road drama. Check it out as the two stars prove they don't look a day older than when they shot the Ridley Scott movie, released in May of 1991. While the term Selfie is fairly new, gaining prominence in the past decade duo to the oversaturation of social media and teenagers obsessed with snapping photos of themselves, the act of holding a camera out to capture one's own image is a practice that has been around since the first instamatic camera became available at the local drug store. While Thelma & Louise didn't invent the Selfie, they did popularize the photographic act with their iconic scene from the 1991 road trip adventure about two late-in-life bloomers who hit the highway to escape their oppressive home lives. Check out the original poster, which capitalized on the photo for its promotional push of this summer film, which went onto become one of the most beloved buddy movies of the past two decades.